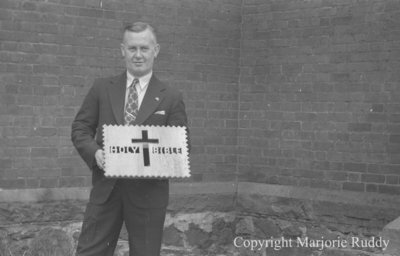 A black and white negative of an unidentified man holding a book rest that he will present to Reverend Adye. Carved into the book rest is a cross and the words "Holy Bible". Rev. Edwin Adye Receiving Book Rest, May 26, 1938, Marjorie Ruddy. Whitby Archives A2013_040_939C.